WHERE DID THE YEAR 2012 GO? Hard to believe that we are getting ready to start another year--where did the year of 2012 go? It seemed like January just a few months ago and now we are the end of December. But we are believing that this coming year will be the best yet and we know that our Lord is Faithful. As a personal note, we are doing pretty well and our family continues to grow and flourish. We are so proud of them and last year for every one's birthday, we did a special post for them on our other blog spot www.butterflycreekpottery.com We, as always, invite you to go there and get to know the family that we are so proud of. Our Family Christmas Eve Gathering this year was so special and filled with "Forever Memories". Despite it being our first Christmas without our precious Memo, Charles' mother, who went to be with the Lord on February 5th this year, at age 97. "Absent from the body but oh, so present with the Lord". We rejoice for her. There was great excitement and joy this Christmas morning, as our oldest grand-daughter, Kayleigh, received an engagement ring from a very special young man, Ryan. So we have gained our first grandson-in-love (law) in our family and we are blessed. Needless to say, this proud Meme and Granddad will keep you updated on all of the wedding plans as they begin to take place. I've just finished clearing up, actually deleting the pottery that was on this Website for sale because it had all been sold. So this afternoon or tomorrow, I hope to get started posting some of the pottery pieces for sale that we've made for this coming year. We will have a number of special new items coming as well and are excited for you to see them. We were so busy with special Christmas orders these past months that we never even had time to update our Website blog. We did a series of two different Snowmen/Snowladies/Snowkids groups this year and they sold faster than we could make and post them. Sorry to those of you who missed out, but they will be on the Website for our Christmas in July this year. These along with another new Snowfolks series that we launched with our Grandchildren on Christmas Eve. Some of the other wonderful things that happened were that folks would say "can you make this or can you make that", to which we would respond, we can try--why not!! Those suggestions turned out to be real keepers and will be on our blog as well, especially in July. Right now we are working on some wonderful items for Valentine's Day, Easter, Mother's Day, Father's Day and just any special occasion you can imagine. Maybe even a couple of weeks set aside for "Give a piece of pottery and be blessed occasion". We love making new things, but also love the round the year favorites: Man Mugs, Raku crosses and vases, hosta leaf and elephant ear impression pieces, bird houses, chip and dip platters, large bowls with two dimensional accents, casserole dishes, large to small plates, platters and bowls, sea shell and fish plates and bowls and the list goes on. We are going to try our hardest to keep you more in touch with our joy in pottery making and all that goes on in Butterfly Creek Pottery workshop each week/month. You may be able to hear our creative minds "buzzing", even in your part of the country. So again we ask the Lord blessings on the works of our hands that He has given to us as His gift, just because He loves us. The Lord wants His people to succeed and not fail, prosper and not despair, rise up and not grow weary, grow and not give up--so this is our challenge to ourselves and all of you as well. A very, very blessed coming year, maybe even a Year of Jubilee for His People, that would be wonderful. There is great excitement at Butterfly Creek Pottery Studio today. Our Studio shop is open for business! Please stop by, browse as long as you like and then buy some pottery. We are so blessed using our God given gifts. To think that these all pieces start out as a lump of clay, nothing more. Then as the creative spirit rises up inside of us and after a number of processes (drying, sanding, first bisque firing, glazing and then final glaze firing), each piece takes on its own individual characteristic and beauty. 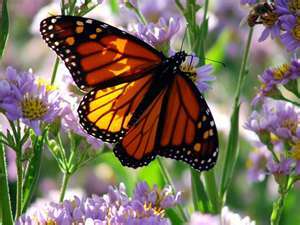 We so enjoy what we do and thank the Lord for His faithfulness, mercy and grace. Keep watching, more pottery will be added as often as we can. Thank you again for your support, encouragement, prayers and love in this "new chapter" in our lives. 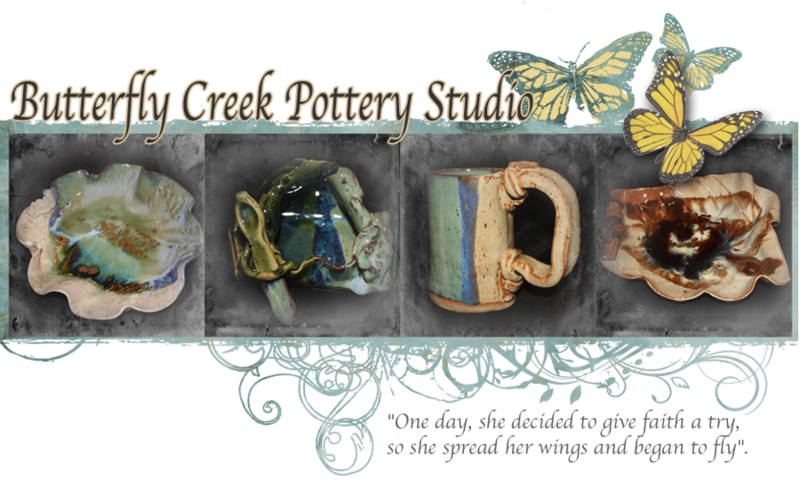 Welcome to Butterfly Creek Pottery Studio. What was a dream a couple of months ago is now a reality; I'm thrilled to announce this new blog. Visit, browse, and select from my pottery creations that perfect piece for yourself or for someone you want to bless. Butterfly Creek Pottery Studio frequently displays new pieces. Please visit often. Pottery is my passion and as a master hand-builder, each piece is unique. My husband, Charles, who refers to himself as a "clay-mule," offers his special man mugs, Raku crosses and vases. Shop at my studio and tell your friends. I appreciate you and your interest in Butterfly Creek Pottery. My pottery creations are God's gifts for which I am grateful. Please click on the buttons above for each category of pottery and you can see what is available along with the price and the Pay Pal information to buy these items. Again, thank you for visiting our site and buying our creations.